The film is based on the classic theme park attraction, which operates in Disney Parks around the world and takes guests on a guided tour through the rivers of the world. According to sources, Jaume Collet-Serra (Reverie, The Commuter, The Shallows) is on board to direct the film. Oscar nominee Michael Green (“Logan”) wrote the most recent draft of the script. He rewrote a screenplay by J.D. Payne and Patrick McKay. When talking to Disney about this movie, sources say Disney sees the film as another major franchise in the vein of its billion dollar “Pirates of the Caribbean” series. 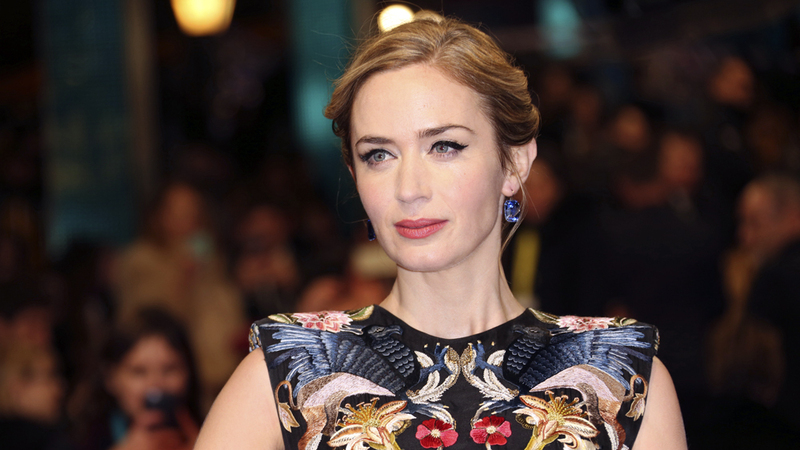 Sources say Disney has been overjoyed with early footage of Blunt in “Mary Poppins” returns and that they are looking for a way to keep her in the family with another potential franchise. I’ll admit I’m somewhat excited about the potential of this movie, but since it’s really early I’m not too excited…yet. This announcement gives me some hope because this movie has another bankable, well-known star set for it. With this star power maybe, just maybe, there will be enough money spent on this movie to produce a quality picture that all of us can get excited about seeing. While Magic Kingdom re-opened yesterday following two days of closure for Hurricane Irma, the Jungle Cruise attraction remains closed at this time. While the majority of the park is in good shape following the hurricane, the high winds caused considerable damage to the Jungle Cruise landscaping. Disney is saying more time is needed to get the ride ready for guests. The park schedule currently shows the ride will remain closed through September 17th, but this may change. It’s a jungle out there, all right. Johnson has been attached to star in the theme park-inspired film since 2015. Production is scheduled to begin in the spring of 2018, with a wide release tentatively slated for 2019. Before Johnson begins production on Jungle Cruise, he’ll shoot New Line’s video game adaptation of Rampage later this spring—around the same time Paramount’s Baywatch reboot surfs into theaters. Later this summer, Johnson will begin filming Skyscraper in China, which will wrap in the fall. His next film, Columbia Pictures’ Jumanji: Welcome to the Jungle, is out Dec. 22. The same-day reservations test continues at the Magic Kingdom’s Jungle Cruise Skipper Canteen following the original test period which ended on February 27th. The Jungle Cruise Skipper Canteen in the Magic Kingdom will be testing same-day reservations later this month. The test will run from February 12th through February 27th. Guest will be able to make reservations at jungleskippercanteen.com or via 407-993-1933. No word yet on when full reservations will be available. The restaurant is currently open daily for lunch and dinner on a walk-up basis. The Jungle Cruise Skipper Canteen soft opened yesterday and will officially open on December 16th in Adventureland. All service is on a walk-up basis only. No reservations are being accepted at this time, although is expected to change sometime in 2016. The restaurant is open for both lunch and dinner, and perhaps surprisingly and unlike the most recently opened restaurant, Be Our Guest, the Skipper Canteen does not serve alcohol. Here is a look at the full menu. – Pho Broth served with choice of Chicken, Duck Breast, or Tofu served with Jalapeños and mix of fresh Herbs. Duck $23, Chicken $22, Tofu $20. Disney has yet to release any official information on the restaurant yet, so remember, what follows should be treated as speculation until confirmed. Located in Adventureland just across from the Tree House, the restaurant will be table service for both lunch and dinner, with entrees averaging around $15 and desserts $8. Capacity is expected to be approximately 220 guests, that will be split into multiple rooms. The main dining room will be the Mess Hall, with other smaller dining rooms leading from that central area, including reportedly one dining room that will be hidden behind a bookcase which once served as a secret meeting room of the famed Society of Explorers and Adventurers. There is also a Schweitzer family dining room, separate from the Mess Hall. The menu is expected to be inspired by the rivers of the world, with an emphasis on African, Asian and South American cuisine. Menu items include Char sui Pork, Steak with Yuca Fries, Stir Fy, Falafel with a Cucumber Salsa, Pineapple Coconut Cake. 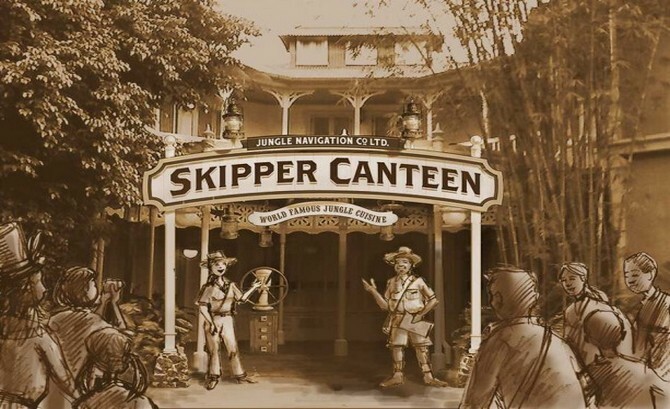 As you would expect from the name, there will be nods to the Jungle Cruise throughout, and servers will be dressed in the same costume as the Jungle Cruise skippers. Two signature cups will be available for purchase with signature drinks including the Punchline Punch and Schweitzer Slushie. Still no word yet on an opening date, but it will begin offering walk-ups only later in December, with reservations available following the initial walk-up only dining. A wild and once-in-a-lifetime experience is coming to Disneyland park. The Jungle Cruise Sunrise Safari Breakfast will take place on select dates from September 21 to December 2, 2015. Your Sunrise Safari will begin with a welcome from the Jungle Navigation Company, Ltd., before you dive into breakfast on the African veldt of the world-famous Jungle Cruise attraction in Adventureland. I would be “lion” if I said this wasn’t a special opportunity — it’s not everyday that you get a chance to dine in the attraction. Your roaring hunger is sure to be satisfied with an assortment of fresh pastries and scones, exotic fruit and chia parfait, eggs cooked to perfection, glazed pork belly bacon, pan-seared sausage and roasted golden potato-and-onion hash. Quench your thirst for adventure with an assortment of juices, freshly brewed coffee and specialty teas. Following breakfast, you’re going to get a crash course in Jungle Skipper training before getting behind the wheel of your own boat to recite that famous spiel. Upon your Initiation into the elite “Fraternal League of Secret Skippers,” you’ll receive an exclusive keepsake—a tribal mask inspired by original concept art for the Jungle Cruise attraction. Reservations are extremely limited and are now being accepted. Make yours here. Dwayne Johnson is teaming up with Disney to translate a theme park ride to the big screen. 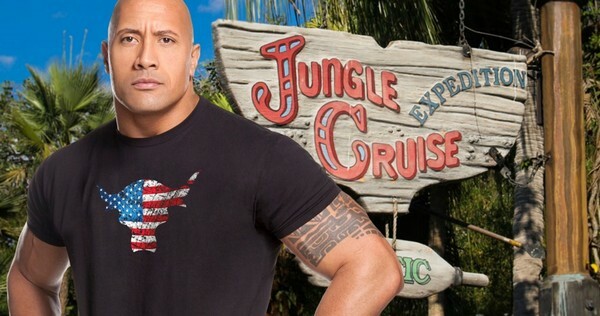 Johnson is attached to star in Jungle Cruise, based on the classic ride, while John Requa and Glenn Ficarra, the duo behind the Will Smith heist movie Focus, have been tapped to write the script. The duo, who have directed movies such as Focus and Crazy, Stupid, Love, are not attached to helm at this stage. John Davis and John Fox of Davis Entertainment, the banner behind Man From U.N.C.L.E., are producing. Johnson’s involvement once again puts the Jungle boat back into the water after a multiyear dry-dock phase. 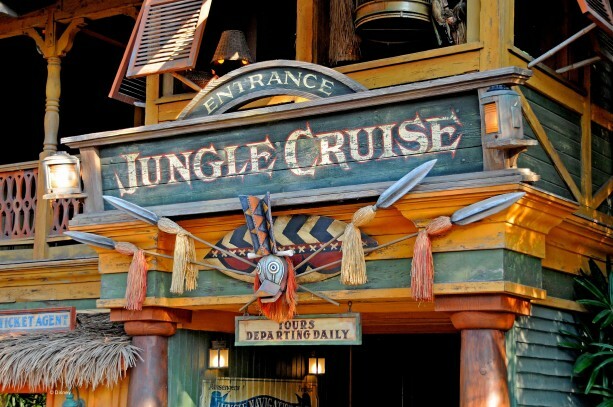 Jungle Cruise is one of the Disneyland’s original rides and has a retro adventure vibe, transporting parkgoers into a melange of African settings such as the Nile River and Congo River, encountering rhinos and hippos and headhunters along the way. There’s an Amazon River section featuring piranhas. The project is in early development, and it’s unclear where it would fit into Johnson’s busy schedule. The actor is currently shooting the action comedy Central Intelligence for New Line and will shoot Baywatch with Zac Efron early next year. He is also due to reteam with his San Andreas director Brad Peyton for New Line’s adaptation of the video game Rampage. Also on the docket, although without any specific dates, are a new Fast & Furious movie and a Shazam!movie. The actor already has an anchor in Disney by being a lead voice in Moana, the animated project that emerged as one of the buzzy movies out of company’s D23 Expo last weekend. Kristin Burr is overseeing Cruise for Disney. Johnson is repped by WME, The Garcia Companies and Gang Tyre. Requa and Ficarra, whose writing credits also include Cats & Dogs and Bad Santa, are repped by CAA and McKuin Frankel.